3rd Earl of Bristol in [DNB]. Augustus Hervey's Journal, edited by David Erskine (grandson of 4th Marquess of Bristol), 1953, repub 2002. Journals of the Hon. William Hervey, published 1906. This is General William Hervey, brother of 3rd Earl. See 3rd Earl and Little Augustus in index p.533 and p.543. 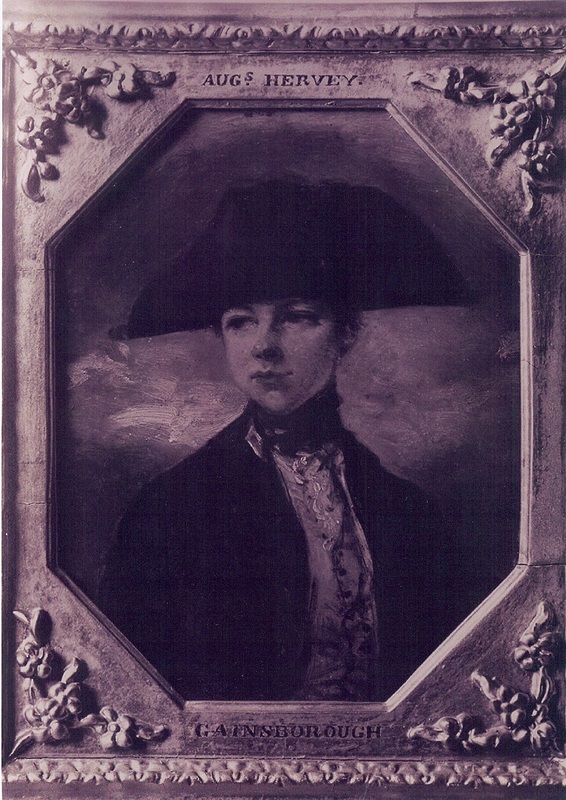 Painted c.1900 by William Silas Spanton, after a 1762-1763 portrait by Sir Joshua Reynolds. See larger. From NPG. See here. Creative Commons. See more pictures at NPG. MP, Admiral in Royal Navy, Chief Secretary for Ireland. Augustus and Elizabeth both had lovers. They separated 1749. Elizabeth became a Duke's mistress (and then wife). Augustus had many affairs around Europe, with women of all ranks. David Erskine summarises him as "the English Casanova". His journal describes his sexual adventures. See summary. His journal describes affairs with the (willing) inmates of the large Odivelas convent near Lisbon, Portugal. This was an actual convent, not a brothel, as has been wrongly said. John V, King of Portugal had affairs with nuns at this convent. Though David Erskine points out that the convent also had a large population of women lodging who were not nuns. Hervey had successful career in Royal Navy. Also prominent politician. MP 1757 to 1775. He served in Royal Navy in West Indies under Admiral Rodney. 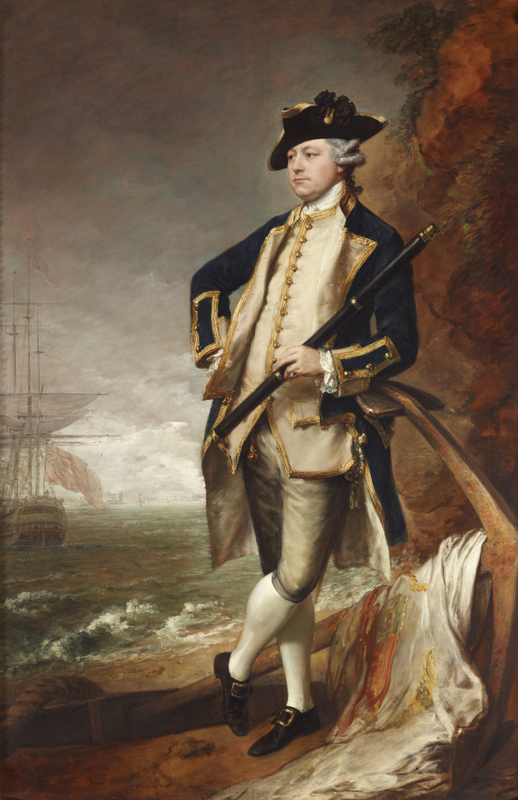 Hervey was made Commander-in-Chief in the Mediterranean 1763, but his active life at sea ceased that year. He was a friend of the 10th Earl of Pembroke. The married Pembroke eloped with Kitty Hunter in 1762. She gave birth to his child in Nov 1762. Pembroke returned to his wife in early 1763. Hervey took Kitty in, and had an affair with her himself. killed on the HMS Courageux, under Captain Constantine Phipps, 2nd Baron Mulgrave. Hervey acted as godfather to Kitty's other illegitimate son Augustus Reebkomp. His brother the 2nd Earl of Bristol was made Lord Lieutenant of Ireland 1766. The 2nd Earl never visited Ireland, but arranged a position for Augustus. Augustus was Chief Secretary for Ireland 1766-67. His affair with Kitty Hunter was over before 1768, in which year he sought a divorce, but not in order to marry her. She married someone else in Feb 1770. Hervey Bay, on Pacific Ocean, Queensland, Australia (see map) was named after him by Captain Cook in May 1770. 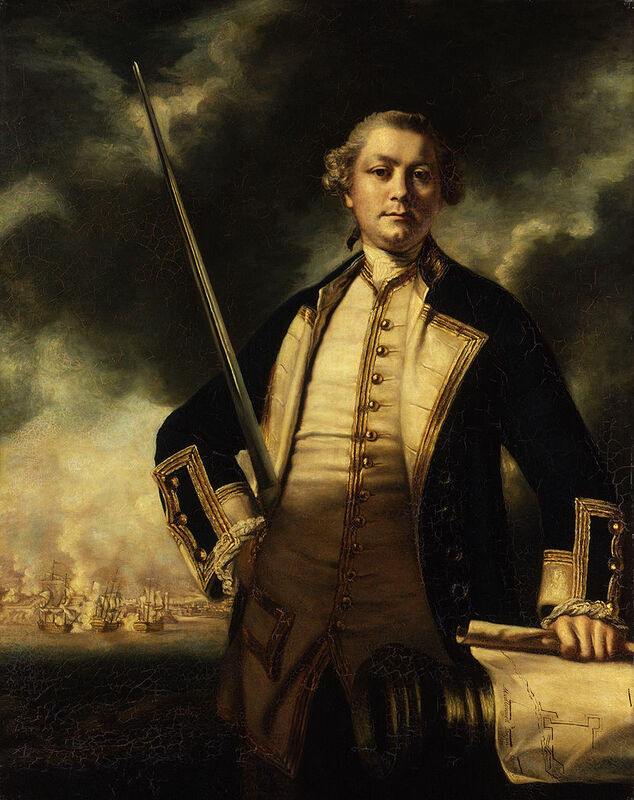 He served as a Lord of the Admiralty Feb 1771 to Apr 1775. He succ his brother as Earl of Bristol 1775. Resigned as Lord of the Admiralty and as MP. His separated wife, who had married again, was convicted of bigamy in 1776. He became Vice-Admiral of the Blue 1778. He died of gout at his town house in St. James's Square, London, 22 Dec 1779, age 55 yrs. He did NOT die in Sept 1779. See [Walpole letter, Dec 1779]. He was bur Ickworth Church (see images). Left everything he could (income and papers) to Little Augustus. Couldn't leave him Ickworth (it was entailed with the Earldom). Little Augustus only lived 3 more years. Portrait by Thomas Gainsborough, c.1767. On the horizon is Morro Castle, Havana, scene of Hervey's triumph in 1762. From National Trust. See here. Morro Castle at Havana, Cuba, when it was captured by the British in 1762. See full size. From NMM. Entry for 3rd Earl in [Complete Peerage]. Unusually, the [Complete Peerage] is wrong about his date of death. [Burkes Peerage] is also wrong. See [Walpole letter, 1779] for correct date. Letter of 23 Dec 1779 from Horace Walpole to Anne Liddell (Duchess of Grafton and, after a divorce, Countess of Upper Ossory). From p.295 of The letters of Horace Walpole, 1861 edn, vol.7. Gives date of 3rd Earl's death as 22 Dec 1779. 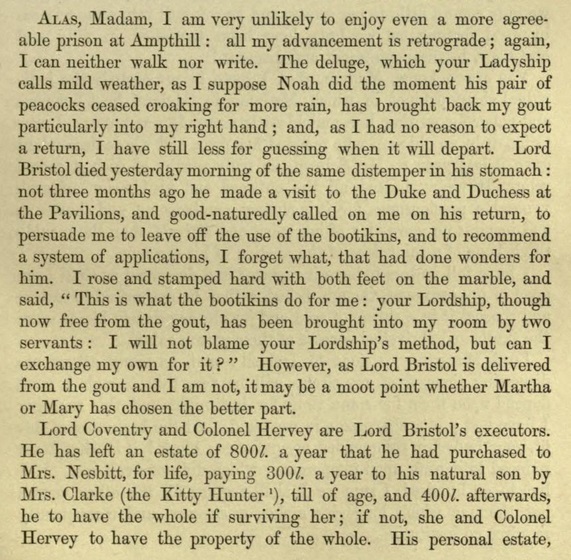 The footnote on this page refers to Walpole's 29 Mar 1763 letter about Kitty Hunter. Letter of 1 Jan 1780 from Walpole to the Countess of Upper Ossory. From p.300 of the same. Letter of 3 Jan 1780 from Walpole to the Countess of Upper Ossory. From p.302 of the same. Walpole above says the 3rd Earl has left some papers to "Little Augustus". He first thinks the papers are the 3rd Earl's memoirs. He then corrects himself that they are the memoirs of his father Lord John Hervey. "Whom God long preserve" is King George III (died 1820). Lord John Hervey's memoirs were eventually published 1848. 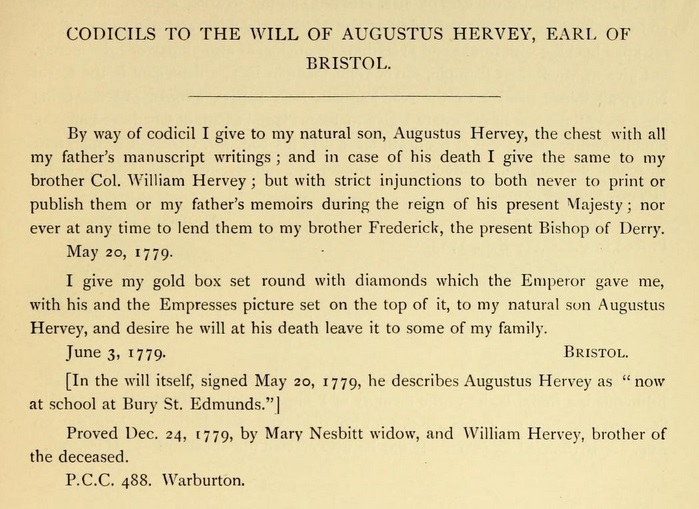 Codicils to will of 3rd Earl. From p.517 of [Journals of William Hervey]. Little Augustus, son of Kitty Hunter. 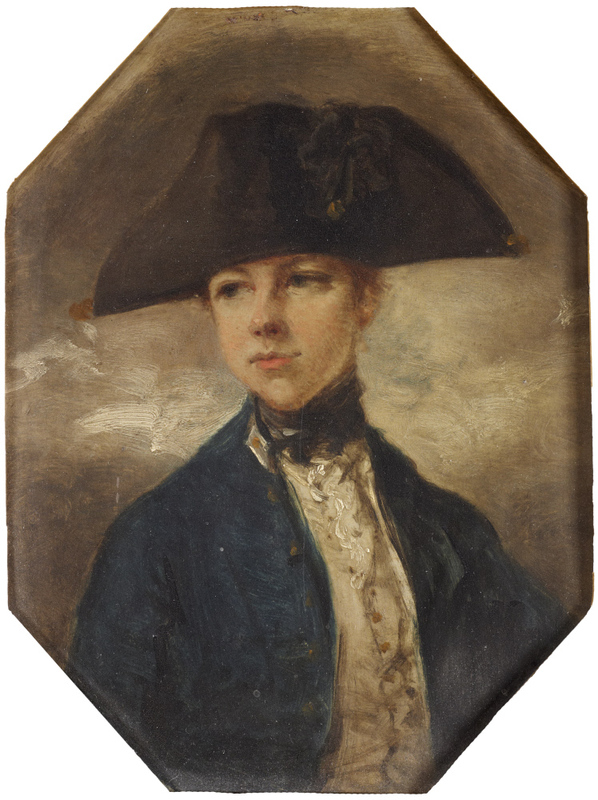 Portrait c.1780 by Thomas Gainsborough. See wider but monochrome shot. See original TIF. Little Augustus in list of portraits at Ickworth. From pp.207-208 of [Farrer, 1908]. "H. and S." means head and shoulders. "S" means small size. Lord Mulgrave is Constantine Phipps, 2nd Baron Mulgrave, who must be this Edward Phipps' uncle, not Augustus Hervey's uncle. From p.517-518 of [Journals of William Hervey].